Deirdre’s wedding to singer Luke Kelly. Actress Sabina Coyne, later the wife of President Michael D. Higgins, is the bridesmaid. The Bronx girl who changed the face of Irish theater. An enigma and a shapeshifter, she changed her first name each time her life entered a new incarnation. Baptized Eleanor, she was Ellie as a child, a little beauty with a bounty of red-gold hair. Her gifts – singing, dancing, and especially acting – were supported by her parents who encouraged creativity in each of their five children. The O’Connell family was different in other ways too, they were three generations of immigrants and emigrants who straddled the Old and New Worlds, continually moving back and forth between both. 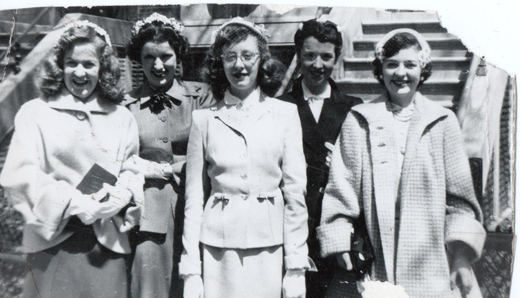 When Ellie attended her all-girl Catholic high school, it was in the conservative 1950s and the streets of her Bronx neighborhood were more insular than mean. It was a community of working-class Irish immigrants bound by a set of strict rules, especially when it came to their daughters. College, barely affordable, was a luxury reserved for boys (although the rare scholarship girl would occasionally slip through). A young woman’s career choices were narrow – nursing school, “going to business” (prefaced by a stint at secretarial school), or, if she was blessed with a vocation, the convent. Bronx girlfriends. Deirdre, then called Eleanor or “Ellie,” on the left. But Ellie wasn’t like anyone else. She cut classes in high school to take classes in drama school and on graduation announced she was going to be an actor. Her neighborhood saw it as an act of rebellion against the tribe. She was signing on with a fast and louche profession. Worse, in New York the best place for an aspiring actor to live, even one just sprung from the nuns, was the world of weirdos, Greenwich Village. Ellie’s roommates were, at various times, acting cohorts, folkies, random beatniks, and at one point, Barbra Streisand. She studied at the Drama Workshop where she immersed herself in the Stanislavski Method, the revolutionary drama technique that had already inspired a whole new generation of actors. Konstantin Stanislavski, founder of the Moscow Art Theatre, demanded his actors have a knowledge of their authentic self and bring personal traumas to their roles. “Acting is all pain, all guts, all inside” was Ellie’s mantra as she became Eleanora, her new name doubtless a tribute to the legendary actress and lover of Stanislavski, Eleanora Duse. 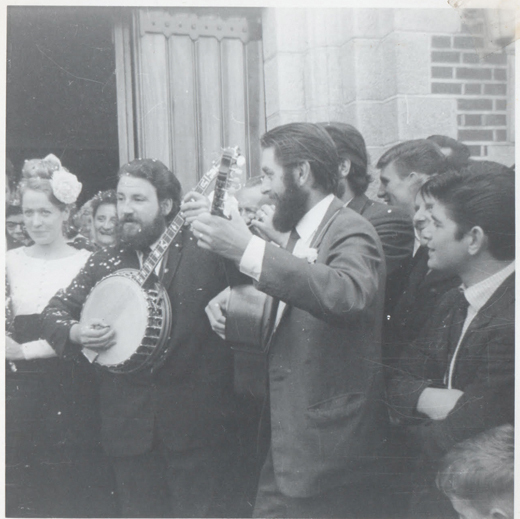 Deirdre, with Dubliners Barnie McKenna and Ronnie Drew, who serenaded the couple as they left the church. Lee Strasberg, head of the exclusive Actor’s Studio (alumni included James Dean, Marlon Brando, and Marilyn Monroe) saw Eleanora in an off-Broadway production and invited her to join the Studio. She acted on and off Broadway in plays by Tennessee Williams, Arthur Miller, Samuel Beckett and Henrik Ibsen. In her spare time, she performed in coffee houses and even sang at the Newport Folk Festival, sharing a stage with Joan Baez and Bob Dylan. Her star was rising but her dream was veering in a different direction altogether: she was going to Ireland to establish a school and theatre, the first to be dedicated to the Stanislavski Method. She was 23, had no money, but needed to follow her heart, and Ireland, she knew, was her soul’s home. She arrived in Dublin in 1962 and again changed her name, this time forever. Eleanora became Deirdre, borrowing from the tragic Deirdre in Irish mythology whose story was told in the classic Synge play, Deirdre of the Sorrows. Deirdre established an actor-training school in Dublin’s Pocket Theatre, teaching her students improvisational work, effective memories, and later directing them in small productions. It was all groundwork to create a permanent company of actors trained in the Stanislavski Method, her dream that was later realized as the Focus Theatre. 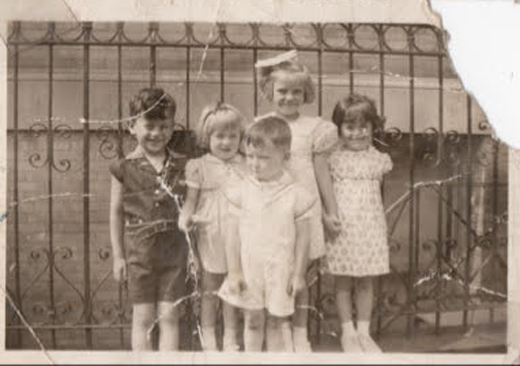 Left to right: Emmett O’Connell, Eleanor “Deirdre,” Jerry O’Keefe (cousin), Marie diMaggio (neighbor), and Geraldine O’Connell. Today it’s difficult to understand just how bold her move to Ireland was. She arrived not during the heady days of the Celtic Tiger, but when the country was a Northern European backwater, economically depressed and artistically repressed. Free of Great Britain, Ireland was now enslaved by religion, reactionaries, and censorship, having devolved into a theocracy. The nation’s puritanical and patriarchal leader, Eamon de Valera, sought to embody Ireland in its Catholic heritage, a crusade that enlisted a leading cleric, the fanatical Archbishop John Charles McQuaid. Together they created a moralistic society that evoked almost sharia law as it condemned “alien influences” from jazz to tampons to unsupervised dancing. Anything deemed “obscene and indecent” in literature or films was banned. McQuaid’s bile was particularly directed at women as he railed against contraception, Jayne Mansfield, and female athletics, and he once collapsed at the sight of naked mannequins in the window of a Dublin department store. Magnetic Luke Kelly performs in London, 1964. The Ireland of 1962 was hardly the place to welcome a free spirit like Deirdre, an actor who had performed Tennessee Williams on the New York stage. It was hardly fertile soil for the Stanislavski Method, a groundbreaking technique that demanded actors draw on emotions in their inner lives. How would this happen in a world where emotions and inner lives are taught to be hidden? She didn’t receive much support from Dublin’s theatrical community either as they held fast to the belief that actors were “born not made.” It seemed the method she taught and the country she loved were alien to each other. 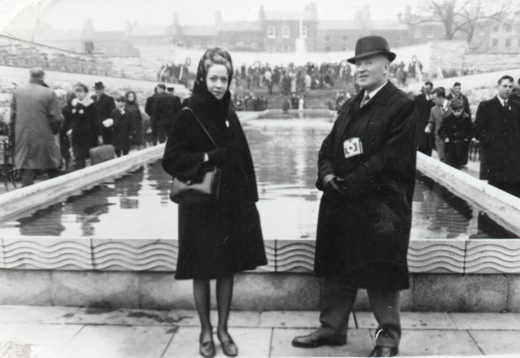 Luke, the card-carrying communist from the Dublin docks and Deirdre, the otherworldly creature from the South Bronx, came together and married in 1965. Her maid of honor was Sabina Coyne, an actress in Deirdre’s company and the future wife of Ireland’s current president, Michael D. Higgins. Deirdre’s sister, Geraldine O’Connell Cusack, said of the couple, “So alike were Luke and Deirdre, they could have been mistaken for brother and sister, the same flaming hair and the same searing fire in their souls.” They were celebrities, an almost-magical sight as they “tripped lightly along the ledge” of Dublin’s streets. Deirdre with her father, Michael, in the Garden of Remembrance, Dublin. At the urging of his new wife, Luke took a leave from the Dubliners to study folk traditions with Peggy Seeger (Pete’s sister) and Ewan McColl, the “godfather of folk music.” At the same time, Deirdre introduced him to Stanislavski and he brought the same rigor, discipline, and perfect diction to his singing as she did to her acting. He had become more active in communist causes and his radical politics gave conviction and edge to his voice. Over time, both Luke and Deirdre became active in political causes like Amnesty International and Ireland’s Anti-Apartheid Movement, and later supported the H-Block hunger strikers in Northern Ireland. 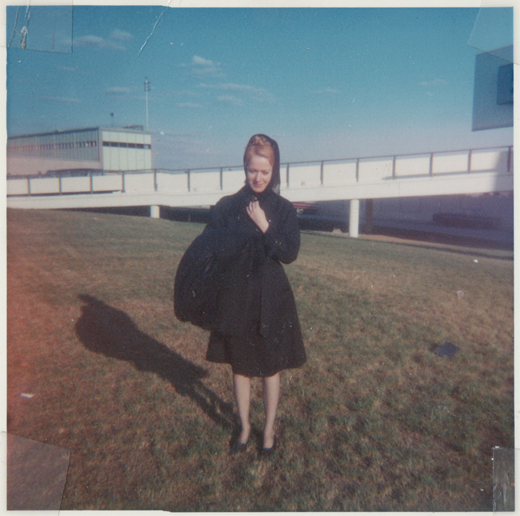 Deirdre at Kennedy Airport, undated. Because it was small, the Focus was always poor and Deirdre always struggling to keep it going, relying on patrons, friends and her generous husband. Unfortunately, Luke’s benevolence extended to total strangers as well, inviting them to live in the home he shared with Deirdre. And his drinking, never moderate, was out of control as he drank “pints for thirst, whiskey to get drunk . . . an accident about to happen.” They separated but their bond remained, and when Luke Kelly died in 1984, she called herself his widow even though they had been apart for years and there had been another woman in his life. Now alone, Deirdre spent most of her time at the theatre, calling the troupe her “family.” She was a frequent sight on Dublin Streets, moving from home to work, known as the “Woman in Black,” a Kathleen ni Houlihan wearing layers of black shawls and skirts carrying a clipboard overflowing with scripts, notes, and snippets of poetry. Years later when she was diagnosed with cancer, she took it on with characteristic independence and determination, telling no one, refusing treatment and even hospitalization. She died in 2001, and, like Luke, was buried in Dublin’s Glasnevin Cemetery, the resting place of heroes. “Deirdre O’Connell was a genius of theatre, of acting, teaching and directing. Ireland is immensely indebted to her. She had visited Ireland once before she came here in 1963 with the mission of bringing the teaching system of Stanislavski, the great Russian theorist of drama, to Ireland for the first time. She had studied and taught at the Erwin Piscator School of Drama and the Actors Studio in New York and had been performing as an actor in New York. “It was a wonderful life changing experience for everyone in Dublin that joined the studio. Deirdre taught us, and gave us the tools to get in touch with, and know, our creative selves. Students trained through a whole series of exercises that had been evolved to develop their capacity in relaxation, concentration, imagination, use of observation through the senses and recreation of experience, physical and emotional sensitivity and expressiveness in sound and movement, and the wonderful techniques of improvisation. “Deirdre and members of the Stanislavski Studio founded the Focus Theatre and put on great modern classic plays of the 20th century, by authors such as IBSEN, Arthur Miller, Tennessee Williams, Sartre, Camus, Beckett etc. “These were all on social themes concerned with the problems of people and society, so we all became more aware and concerned for humanity and also for feeling responsible to participate in every way we could. Many who trained with Deirdre found that their best medium of expression might be in other areas of the arts and education so the influence of the techniques for creative development reached in and nourished many areas of Irish life. We are eternally grateful that she choose to come and live here and share her genius and love with us. 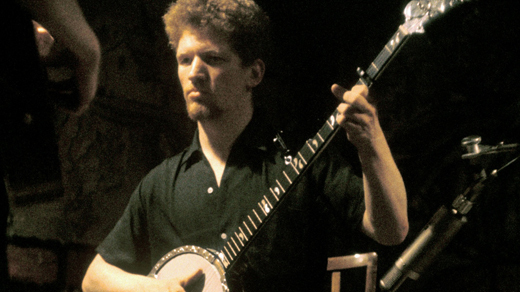 “She married Luke Kelly, the great ballad singer of the Dubliners. I had the privilege of being her bridesmaid. It was a glorious day, the church at Whitehall was filled with their guests – their families, the Focus people, the Dubliners and I think the Clancy Brother’s and Thomas Makem and many friends. “Deirdre was maybe the most striking looking woman in Dublin, dressed in black and with her pale skin and golden red hair piled on top of her head. They were a golden couple. On her wedding day Deirdre wore a beautiful black dress with a white raw linen jacket and a flower in her hair. I wore a deep blue velvet dress trimmed with heavy cotton lace. Emmett, who became a successful businessman in the mining and oil exploration business, supported his sister when he could. But he says, “She carried the load mostly herself. Everything she earned went right back into the business again. It was always a hand to mouth experience and she was too proud and too earnest to take advantage of anyone’s generosity, in the end she always managed to squeeze through.” He missed the wedding though because he was on a graduate scholarship in Sweden, and he thought they would never go through with it. Emmett O’Connell was inducted into the Irish America Hall of Fame in 2015. “The Dubliners formed an arch with their instruments as they left the church following the wedding, and it was on to Howth Tavern, where the owners threw the bride and groom a reception. Eleanor wore black but Emmett had taken her in to Brown Thomas and bought her a white lace bolero, which she wore over the black, with white nylons and black shoes. “I always remember Luke saying, ‘Isn’t she beautiful.’ Eleanor had a flower in her hair.